The High Ridge Fire District reported there was at least one person trapped in a vehicle. JEFFERSON COUNTY, Mo. — A crash in Jefferson County is causing a traffic backup southwest of Fenton in the Murphy area. Emergency crews responded to the wreck at State Route 30 and Valley Dell Drive. There were victims trapped in both vehicles, including a child, the High Ridge Fire Protection District reported. A Mercy medical helicopter responded to the scene and flew the child to Children's Hospital. Both drivers were taken to the hospital by ambulance. All patients had non-life threatening injuries. 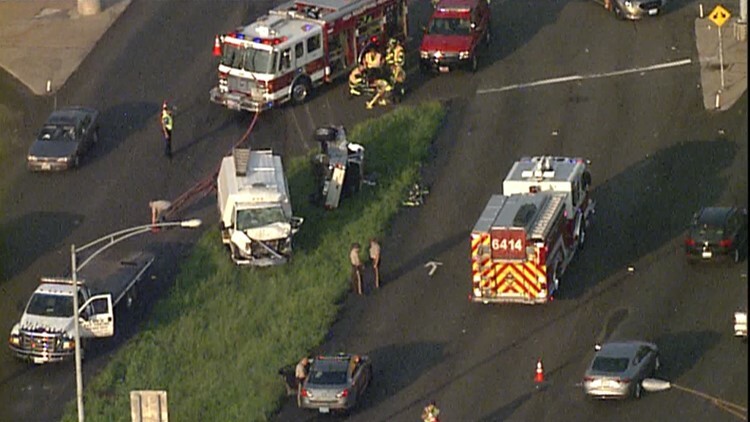 Sky5 showed a service van and pickup truck in a grassy median. The truck ended up on its side with a large dent on the driver side. The van had damage on the front, and the windshield was shattered. A witness said the light turned green and the truck was hit in the side when it entered the intersection, MSHP reported. Police closed the eastbound lanes while officers investigated and crews removed the vehicles.